No, it’s not a children’s book or a gangster movie. 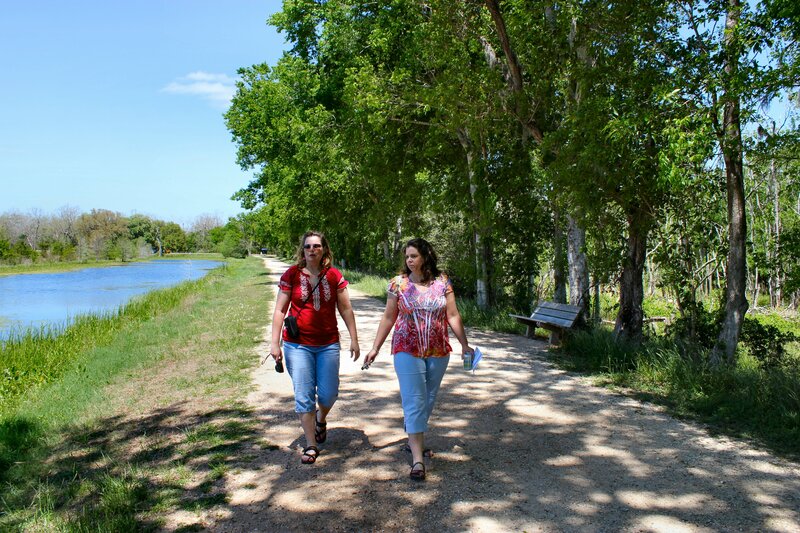 When Mom and two of my sisters were here last week, we packed a picnic and went down to Brazos Bend State Park south of Houston to spend an afternoon under the live oaks. It was a gorgeous day with temperatures in the low 70’s, sunny skies and a great breeze. We went on a Wednesday, so we practically had the entire park to ourselves which made it even more peaceful. 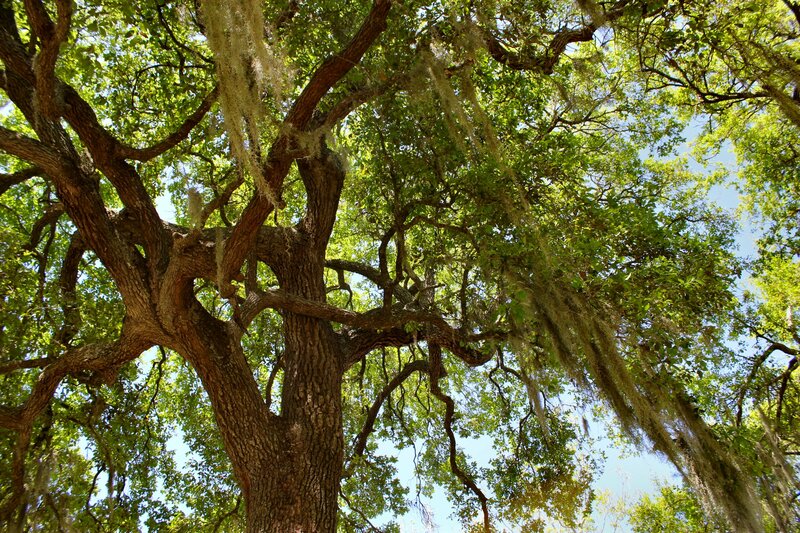 We found a picnic table under a big live oak tree dripping with Spanish moss and spent a relaxing afternoon enjoying the scenery and each other’s company. It was beautiful. It was glorious. 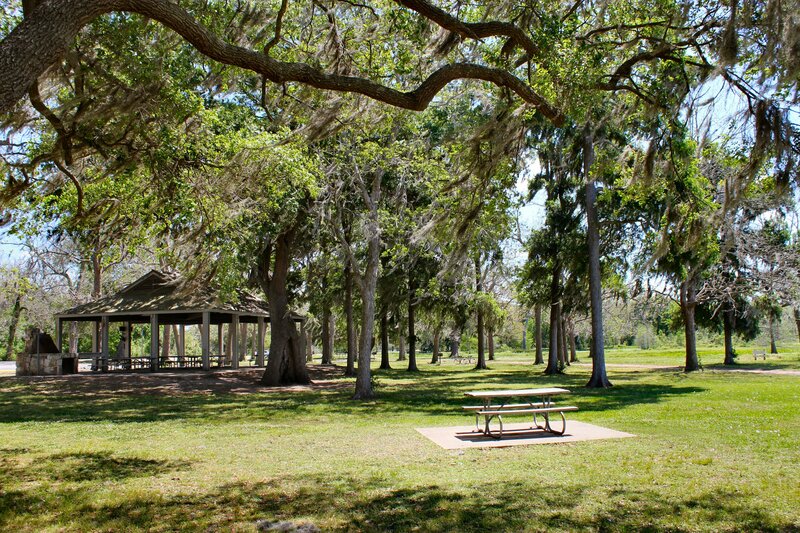 There’s something about a picnic on a lake, under a live oak with nothing but the sound of birds chirping that’s just good for the soul. I can’t describe how relaxing it was. 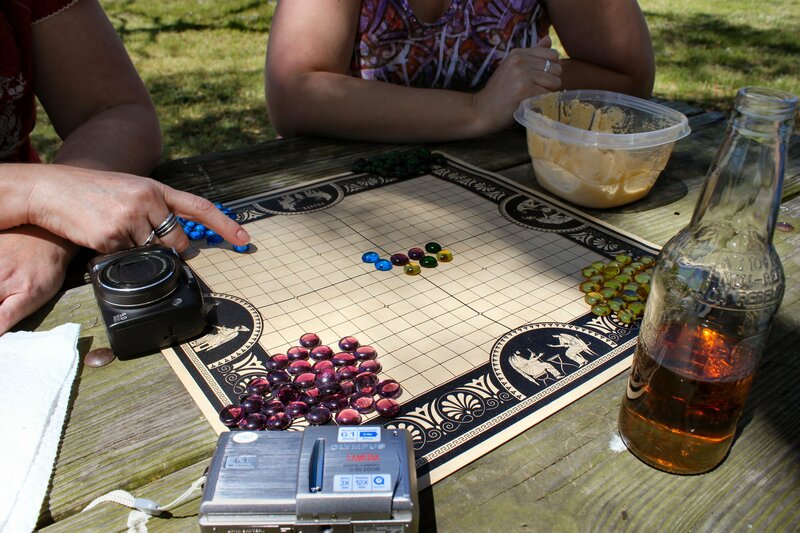 While we ate, we broke out the Pente board. Pente was really big back in the early 80’s, if you’re old enough to remember it. We played Pente several times while the girls were here. If you’re not familiar with posts about my family, we’re big into playing cards and board games. Sometimes we even break out the 1,000 piece puzzles. Scrabble, Phase 10 and Cranium rate high on our list, too. 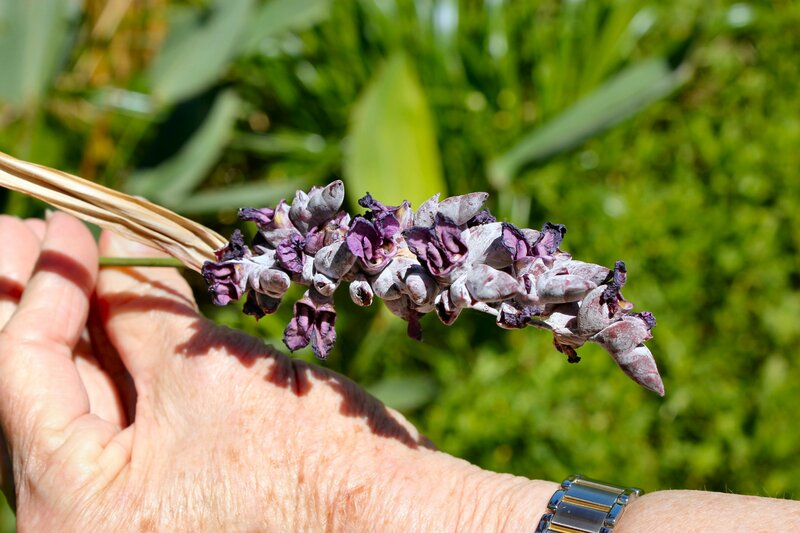 Subconsciously, I think we’re all hoping that this ritual of working our brains will help keep senility at bay. Check back in 20 years, and I’ll let you know how that worked out. But on this day, we kept our brain cells hopping with a little low-level strategy and bead stealing while we fed the ravens and grackles. 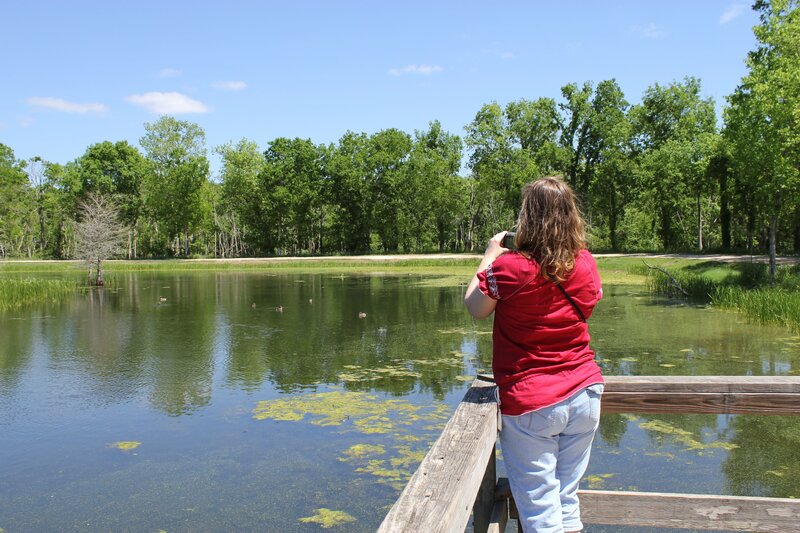 When lunch was over, we packed up the picnic and game board and took a stroll around the lake in search of alligators. Welcome to south Texas, ladies! It’s not like we planned to wrestle them, or anything. We just wanted to see if we could find them and take pictures. 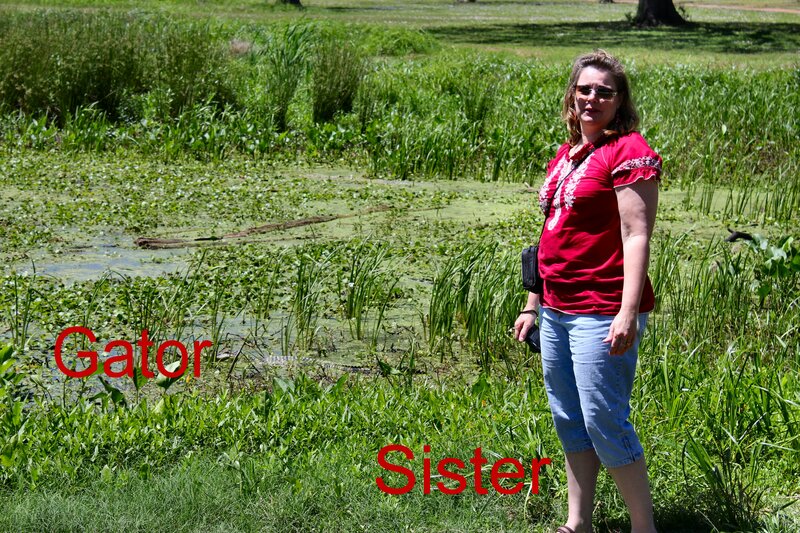 Baby Sister said that our nephew, Gabe the Babe, would get a kick out of it if we could find and photograph some alligators. As soon as we started down the path around the lake, we found one about 6 feet from the shore. Some days, we just get lucky like that. Guess I should have bought a lottery ticket, too. Woulda. Coulda. Shoulda. 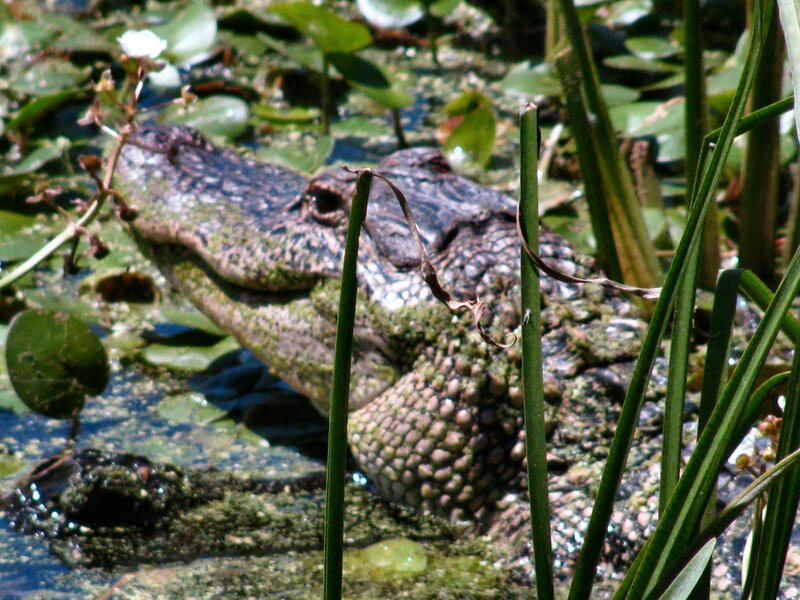 Our gator was kind enough to pose for pictures. It’s hard to tell from the photo, but I think he was about 6 feet long, a Pisces, and into red meat, small woodland creatures and macrame. But I’m just guessing. Hello, handsome! Our Baby Sister was right there with her. Which reminds me…. I forgot to tell them to run in a zig-zag pattern if the gators decide to come out of the water and chase them. Oopsie. Hehe (nervous laugh). Another 10 feet down the path, we ran into a blue heron. Such pretty birds. They really are blue, you know. 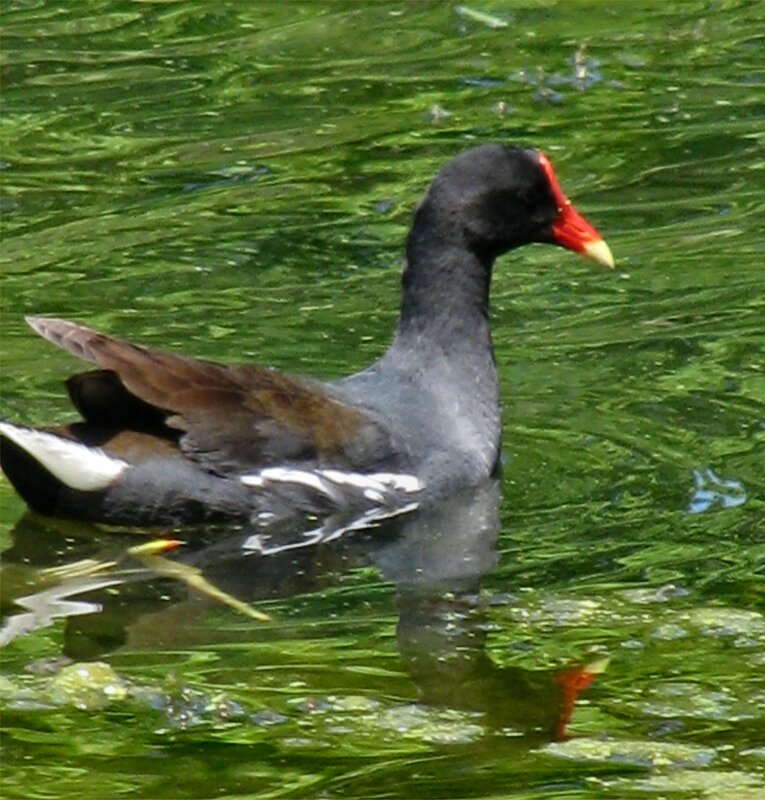 There were other gorgeous birds, as well. 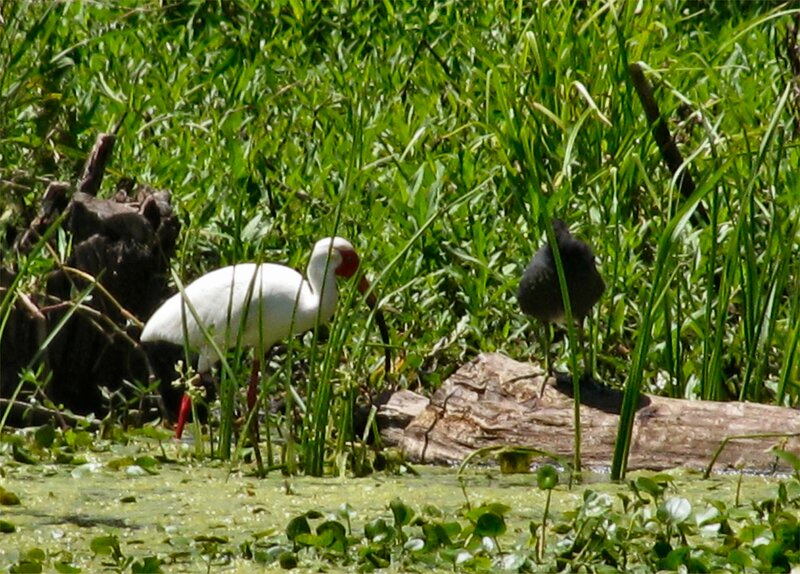 Like the ibis with his long bill (also seen on ancient Egyptian hieroglyphs) and these beautiful red-billed ducks. 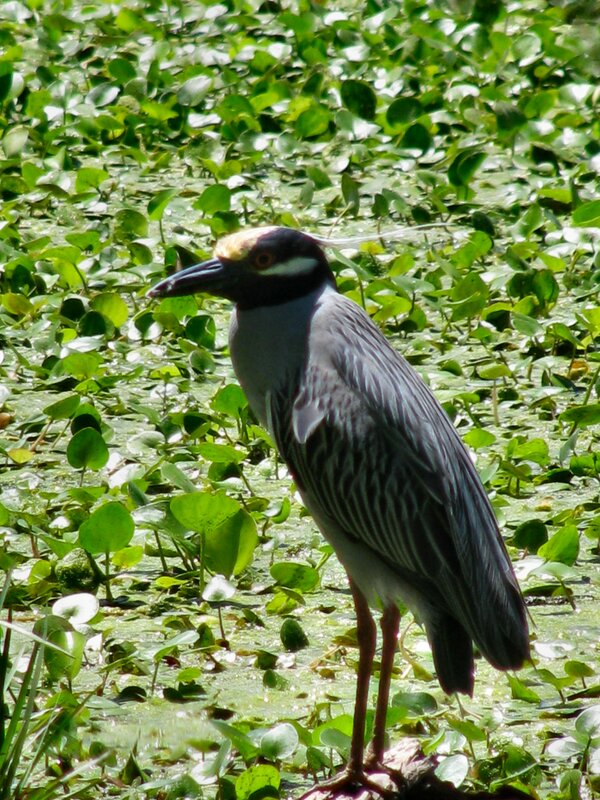 The big lake at Brazos Bend is beautiful. It’s wild, marshy and untamed like me (wait…marshy?) and it’s teeming with flora & fauna. The banks of those little islands on the right are home to all sizes of alligators, turtles and birds. I wish I could adequately describe how lovely it is. It’s so peaceful there. Those decks over the water make an excellent place to stop and take photos. These were growing on tall, thin reeds like cattails. I don’t know what they are, but they were absolutely lovely. Favorite trees? Definitely those gorgeous live oaks. They grow low and wide, like big green umbrellas. When they’re covered in Spanish Moss, they’re just magical. They’re one of my favorite trees. Favorite critter? 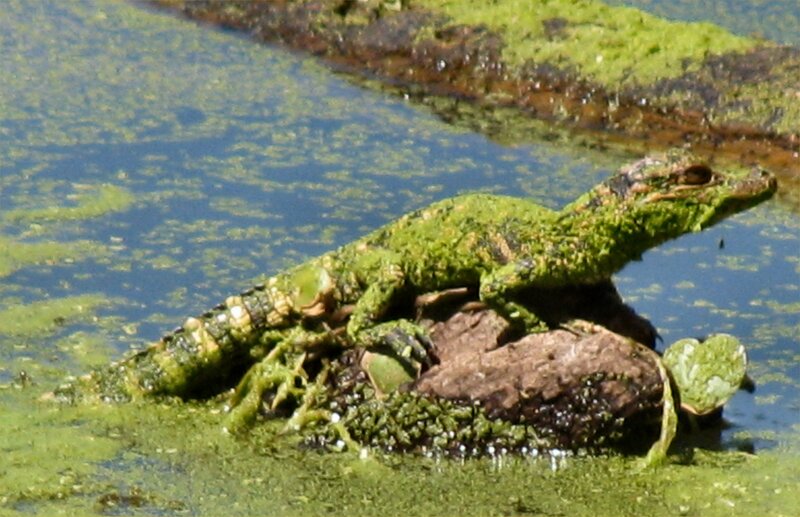 This baby alligator captured by Big Sis and her zoom (again). This little guy was perched on a stump. He couldn’t have been a foot long. At least, what we could see was about a foot long. What is it about little baby animals that make them so stinkin’ cute? Even the deadly ones. Baby lions? Cute. Baby hippos? Cute. Baby cobras? Trick question!! No snakes are cute!! Thank you Mom, Big Sis and Baby Sister. I can’t begin to tell you how much I enjoyed your visit. I enjoyed the antiquing. I enjoyed the baking. I enjoyed that big honkin’ sirloin we grilled up with that baked potato casserole. I enjoyed the chick flicks, the board games, and the pajama nights. But most of all, I enjoyed our picnic in the woods and the chance to just hang out and be ourselves. And laugh. And belch like guys and giggle about it. And swap stories. And relax. It was lovely. And I miss you already. We should totally do this again sometime. And next time, we’ll see if we can’t get all the sisters and My Baby to join us! Okay, this: “I think he was about 6 feet long, a Pisces, and into red meat, small woodland creatures and macrame.” totally made me crack up! Gorgeous pictures! What a wonderful backdrop for a family picnic. Reminds me of my honeymoon to NOLA. Tom and I won a free swamp tour. I got to hold a baby alligator about the size of the one in your picture. He was so cute! (and I think baby snakes are cute too, sorry!). There was spanish moss everywhere and a cluless lady plucked it from the trees and wrapped it around her neck like a scarf. Tom just shook his head and said, “Lady you don’t want to do that.” The boat captain saw her and told her to throw it overboard. 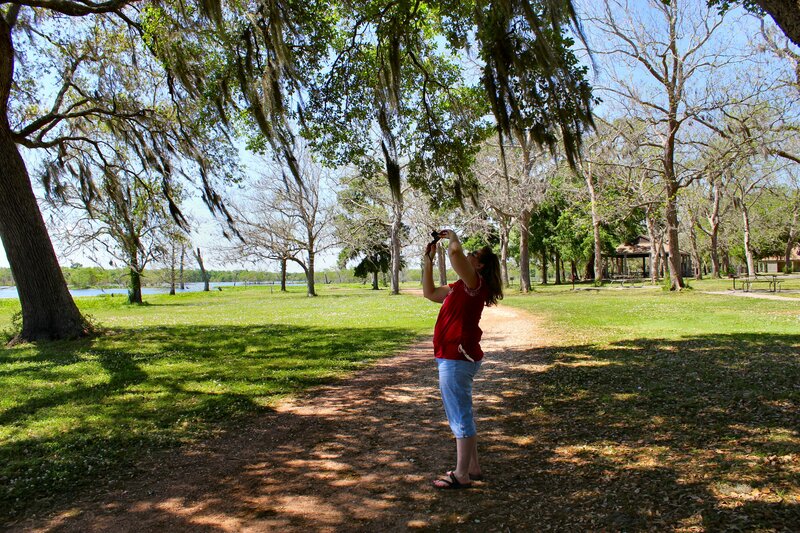 She had no idea that chiggers liked spanish moss, too. We laughed and laughed. The lady didn’t think it was funny for some reason. Anyway, love the pictures and it’s awesome that you and your sisters are so close and have so much fun together. Wait. “…snakes dropping out of trees into boats.”?!! (((shudder))) The only thing that would be worse than a snake dropping in front of me would be if a tarantula was hitching a ride on it’s back. Blech! Most of our snakes are of the tiny garden variety, and I don’t like them much, either. We only have one venomous rattler variety, and I am told they are small in comparison to yours. The image you created of a tarantula hitching a ride on a snake’s back made me laugh. Then I got the heebie-jeebies. Bad. Looks like a lot of fun and wonderful pictures. One day I want to see Spanish Moss in person. 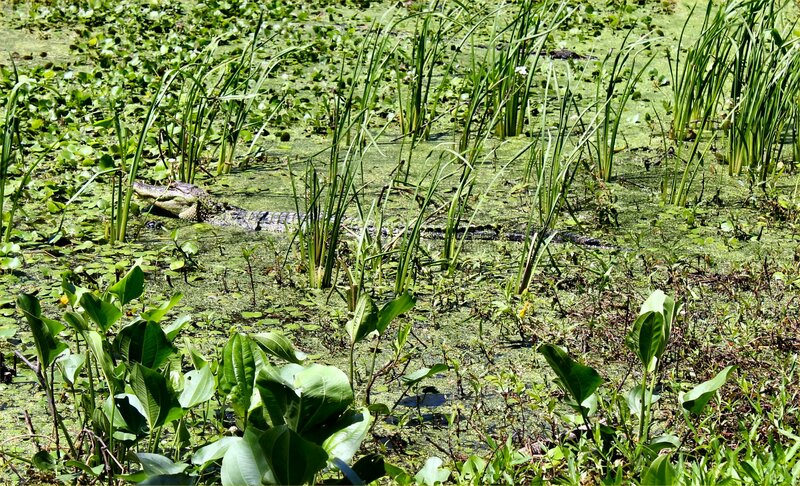 I could do without the alligators, though! You know, if you would just hurry up and buy that house across the street from me, you could see live oaks dripping with Spanish moss any time you want. Did I mention it’s going to be 82 and sunny all weekend? Awwwww….lovely! Nothing like a cool sunny day in the park. You’re a piece of work, KJ. And I mean that in the most delightful way possible. You always make me laugh. Childhood sunbathing? Priceless! It sure does look like a wonderful day! I really wish we had something similar here in Las Vegas. 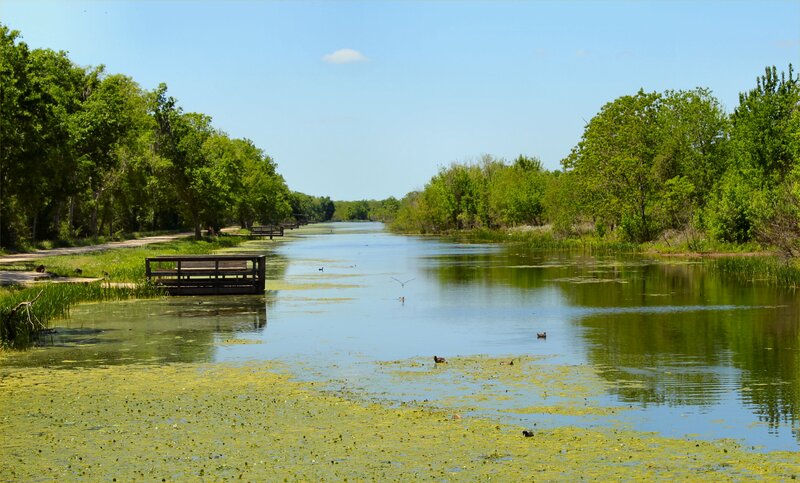 I would sure love to visit the Brazos Bend State Park since I love, love, LOVE adventure and wildlife! I haven’t been to Vegas in a while, but I’ve always wanted to visit Joshua Tree national park and the Canyonlands which are both closer to your neck of the woods. Some day. Maybe sooner rather than later. The Complete Package and I have been discussing a visit to the canyons – Grand, Bryce & Zion – this fall. Any suggestions? Oh these photos are awesome! It looks like it is really beautiful there. It is beautiful, Alicia. It really is. And it was especially lovely because it wasn’t too hot and humid (which it can be in Houston), and the mosquitos were not out yet (which are sometimes the size of small birds). It was a truly perfect day. Thanks for taking the time to leave a comment. I appreciate it! Love the baby gator pic! Thanks, Angie! I like to call him “Old Mossback George” after one of my favorite movies. Can you name it?